Have mercy! Fuller House TV show star Candace Cameron Bure posted a picture to her Instagram account, featuring Bob Saget and John Stamos at a second season table read for the Netflix sitcom sequel to Full House. Stamos posted can’t miss videos of himself alone and with fans, in front of the Tanner House set. Saget also tweeted a picture of himself from the Tanner-Fuller living room set. Check them out, below. 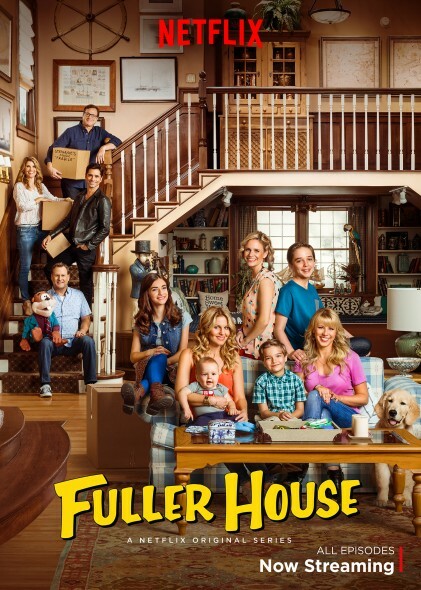 The Fuller House TV series cast for season two includes: Bure, Jodie Sweetin, Andrea Barber, Michael Campion, Elias Harger, Soni Nicole Bringas, Ashley Liao, John Brotherton, Juan Pablo Di Pace, and Scott Weinger. Dave Coulier and Lori Loughlin will also reportedly guest star in the second season. Check out Bure’s picture of Stamos and Saget. Don’t miss this “explosive” clip Stamos posted, claiming he was in front of the “actual” Full House house. Back at work today on #FullerHouse. Check it out, I'm at the real Tanner house having a blast! You’ll be on tenterhooks (or is that tentaclehooks) as you watch Stamos greet some fans. Greeting some fans today in front of the Full House house. "Say cheese!" As a bonus, watch Bure, Sweetin, and Barber singing the theme song, from the studio lot. Stamos has been cast as a series regular in the second season of the Scream Queens TV show, coming to FOX, this fall. Learn more. What do you think? Did you watch the first season of the Fuller House TV series. Do you plan to stream the second season on Netflix? It was boring then and its even more boring now. Cancel it!